When we first saw the TG01 from Toshiba we were both delighted and displeased. There was a lot to like, but Toshiba’s cranky front end to its operating system Windows Mobile 6. When we first saw the TG01 from Toshiba we were both delighted and displeased. There was a lot to like, but Toshiba’s cranky front end to its operating system Windows Mobile 6.1 Professional was, in our view, strangely misconstrued. The TG01 has made a reappearance running Windows Mobile 6.5 and the news is better. The front end, which reminded us of nothing more than a slot machine, is gone, at least nominally. Right out of the box there is, on our Orange-badged device, a simpler main screen comprising a scrolling menu of key features: pictures, music, clock, phone, voicemail, text, email and favourites. Tap that last one and a horizontally scrolling menu pops up that you can populate with apps you're likely to want to use often. It still isn’t ideal, though. As noted in our review of the TG01the first time round, the device is hampered by a touchscreen that needs firm pressure rather than a gentle caress. To be fair, if you are naturally heavy-handed or have not experienced the best capacitive touchscreens, you’ll probably not notice this. But it is an issue. And you can call up the slot-machine-style interface if you want it. 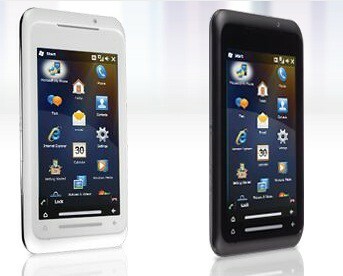 What did appeal last time round, and still does now, is the sleek design and huge screen. At 130mm by 70mm by 9.9mm and 129g the TG01 feels more like a media player than a phone, and its 4.1in. 800-by-480-pixel display is bright and sharp. Toshiba makes the most of it, but even here everything isn’t rosy: the TV Player link pointed to an Orange web page that's currently under development. As for the remaining specifications, there’s the very capable Snapdragon processor, running at 1GHz, as the headline feature. The remaining specifications include HSDPA (7.2Mbps/2Mbps), quad-band GSM, GPS, Wi-Fi, a 3.2 megapixel camera, 512MB ROM, 256MB RAM and a microSD card slot complete with an 8MB card in our review sample. It's just a shame in such large hardware that Toshiba could not have engineered the microSD card slot so that it is accessible without removing the battery. Sadly the headset connector is microUSB at the handset end, although there is a 3.5mm adapter just past the microphone so you can use your favourite headphones if you wish. The hardware details seem unchanged from the original TG01. It appears to be just the updated OS that is new. Full details are at Toshiba’s web site, although when we visited it the device was still being listed as running Windows Mobile 6.1 Professional.